I cannot even tell you how delicious it is. There are fresh strawberries in between the layers. And lots of Vanilla Cream Cheese Frosting. Sidenote: I would like for you to meet Julie. She's my Valentine's Day Orchid. Yes, I named my orchid. Isn't she beautiful? -Bake cake in 2 round 9in pans. Cool on rack. -Once completely cool cut the rounded tops off with a serrated knife. -Spread a layer of cream cheese icing over bottom layer and slice fresh strawberries over top. Spread more cream cheese over strawberries. -Now you can smooth out your icing and add more for a clean look. Beat butter and cream cheese until creamy. Slowly add powdered sugar and beat until smooth. Add vanilla. Add milk in teaspoon increments to reach desired consistency. 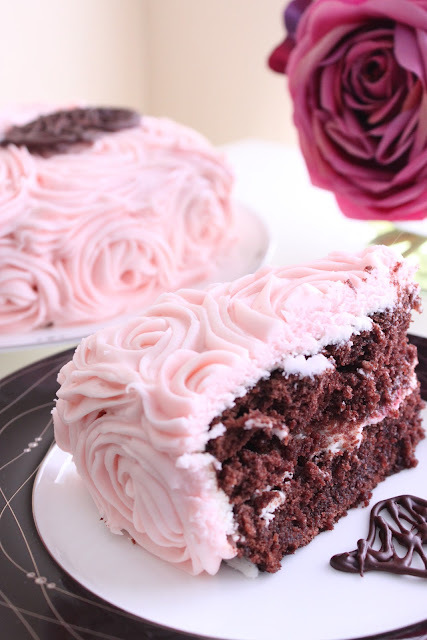 If you plan to pipe on your cake make sure the frosting is stiffer by adding less milk. *If you are not going to pipe on the cake than half this recipe.